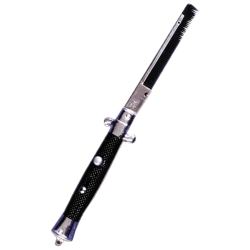 The switchblade comb can either be used as a prop to go along with any 1950’s period costumes such as those for “Grease” or “Happy Days” or for use by directors as a safe alternative to a switchblade knife or razor for shows such as “Sweeney Todd” or “West Side Story”. The switchblade comb measures 4 1/2" in length shut, has a 4" blade, giving it an overall length of 8 1/2" when open. This item looks like a switchblade knife, but when you push the button a comb pops out. We have found that if you paint the comb silver then it will looks like a knife blade pops out.